Over the last few years, there has been a lot of talk about a conference center in downtown Ann Arbor. Although there are several places to have a meeting, there really isn’t much that really fits the conference center description, especially downtown. In addition to published reports, rumors have swirled over the years that Bill Martin wants to build a conference center on the Brown Block, but nothing has come of that so far. More recently, there was a lot of interest over plans released for a local conference center. As so often happens in Ann Arbor, reception to the idea of a conference center has been mixed, with people vehemently in the pro and con camps. I have heard people say they think it is the worst possible thing that could happen to downtown, while others say it is the best possible way to keep downtown viable. Reaction is so mixed that one wonders if some people are thinking of a large industrial convention center like Cobo Hall or DeVos Place while others are thinking of a smaller hotel and conference center like the Fort Shelby in Detroit or the beautiful St. Julien in Boulder (built over a 650-space public underground parking structure). Of course, left out of much of the discussion is the plans of the University. Currently, the University has some conference space, but only 21 rooms . The other Big 10 schools have at least one hotel and conference center or several hotels within walking distance of campus. The University has lots of land and infrastructure on North Campus and married student housing is not doing well. Even if the U doesn’t want to build their own hotel, there are several hotel chains that might be willing to fund much of the building costs for an on-campus conference center. Needless to say, if they do build their own conference center, the City will not benefit anywhere nearly as much as if a conference center was built on city-owned land. So what do you think? Does Ann Arbor need a conference center? Should it be downtown? Should the University build their own? If there is a conference center, what would you like to see be part of it? If you are opposed to it, why? If you are for it, why? Seven bus routes are on detour. Observatory Street (Ann Street to Geddes Avenue) to one-way southbound. E. Madison (Thompson to S. State streets) is limited to eastbound only. A change from previous years’ move-in traffic and not indicated on the maps, State Street (South University to Hill Street) will remain as two-way traffic. 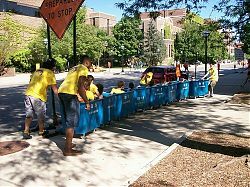 The University of Michigan and City of Ann Arbor Move-In Task Force, preparing for another large freshman class, has set the main Fall Move-In days of Tuesday, August 26 through Friday, August 29, for new and returning students. Bursley Hall Parking Lot (lot NC-31) — Several parking spaces will be controlled August 26 – 29. Richard Kennedy Drive — Parallel parking spaces for U-M service vehicles will be closed August 27 – 29. Thompson Street Structure (W3) — Exit will be permitted on South Division only August 27 – 29. Lot W16 (the “Triangle Lot”), located at Thompson, Packard and Madison — Lot will be closed to all permit parkers August 27 – 29. Lot W18, located next to Parking Services and the Thompson Street Parking Structure — Lot will be closed August 27 – 29. Lot M28, located on Washington Heights across from Markley Hall — Lot will be closed to all permit parkers August 26 – 29. Photo: Bucket train of move-in makers (students who move in early to help move others in) from F2007. As an alternative (or a complement) to a traditional study abroad program, the University of Michigan is now coordinating an undergraduate semester in Detroit program. The program plans to send the first group of 20-25 students in Winter 2009. Organized internships at local community service and arts organizations will be a core part of the program, along with classes taught at the University’s Detroit Center. Students who participate will be living in a Wayne State dorm, not a Detroit neighborhood. It seems to me that many of us UM undergraduates don’t spend a semester in Ann Arbor. AATA has announced route changes to take effect 23 January that will increase service to and from the campus area. A new route, 9U, will connect Central Campus to the Maple Village area, and several routes connecting Central Campus to the Medical and North Campuses, to park-and-ride lots, and to Ypsilanti will be given more direct routes, more frequent service, and, in some cases, earlier morning routes and later evening routes. Read the details at AATA’s website and view the new maps and schedules online or on the new RideGuides available on-board the buses. More people are riding the University of Michigan and Ann Arbor Transportation Authority’s buses. In August, the two systems reached a five-year agreement allowing U-M students, staff and faculty to ride AATA buses for free. Since then, AATA has seen a 12 percent increase in ridership; campus buses have carried 7 percent more passengers. Officials say the figures show more students, faculty and staff at U-M are leaving cars at home and riding the AATA buses to their destinations on campus. Once there, they ride the U-M buses to get from one campus area to another, officials said. The University Record announces the U-M and AATA agreement which was tipped to this site last week. The Record article provides few new details, but features a host of happy-talk quotations from the directors of the University’s Parking and Transportation Services and of the AATA. On August 1, 2004, the University of Michigan and the Ann Arbor Transportation Authority (AATA) will be launching a swell “Unlimited Access” program. Under this contract, AATA will provide no-charge rides on all of its regularly scheduled routes at any time of the day, any day of the week to all active U-M faculty, staff and students who show a valid Mcard ID. In addition, AATA will add at least 8,000 hours of service, tailored to the needs of the University, starting January 2005. These service improvements will be guided by student and employee residential demographics, and input from the University community.